This is a guest post by Carl Jacobs. The Syrian civil war has not been kind to the sacred secular institutions of International Liberalism. There are now 400,000 dead and 11 million displaced as a result of seven years of fighting, and no solution has been found except the stone-cold solution of conquest and victory. It was not supposed to be so. The fate of Rwanda was supposed to have changed things. Institutions were supposed to be in place. The cries of “Never Again!” were supposed to be heeded by the International Community. Nations were supposed to answer the call. But nothing has changed. Each institution in turn has been weighed in the scales and found wanting. The Apostles of the Age cry out for justice, but there is no justice. Whither shall they search next? Journey with them as they survey the lay of the land. We fall at the first hurdle. The United Nations Security Council, into which so many have placed so much hope, is said to have failed. At least we are so informed. Repeatedly. 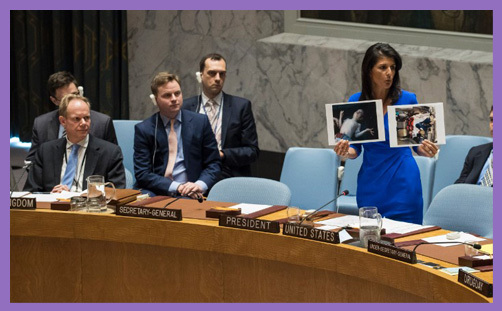 The UNSC has primary responsibility for the maintenance of international peace and security according to its own charter, and yet it has done nothing about Syria. There quickly follows a furrowed brow and earnest declarations about the need for Security Council Reform. But in fact the Security Council has functioned exactly as it was intended to function when Great Power interests collide. It was never meant to handle every security crisis. It was intended to prevent Great Power conflict. The UNSC was given complete discretion to handle any situation in any manner it sees fit. If any Great Power had a national interest, the problem could be shelved. Some situations are simply too dangerous to address. And we should see the wisdom in the design when we observe Syria today – where Russian proxy soldiers have attacked American positions, and American strike fighters have bombed targets in close proximity to Russian forces. With a gangster in the Kremlin and a buffoon in the White House, who can possibly think this situation is a good idea? In any case, there is no help to be found here. Perhaps then the International Criminal Court could provide some relief. It was established as an independent court to end impunity and to punish the guilty for war crimes committed. Syria is awash in war crimes from one border to the other. Perhaps the threat of prosecution could bring the warring factions to agree to peace. Could the ICC possibly be persuaded to interrupt its busy schedule of spending money in order to address Syria? Well, no. Syria hasn’t ratified the Rome Statute and so the Court has no jurisdiction. The Court could receive jurisdiction by referral from the UNSC, but the UNSC won’t refer the case to the ICC. We’re back to that same problem of Great Power conflict. There is none to deliver the guilty to the bar. The ICC is a prosecutor in search of a cop – any cop, but preferably an army masquerading as a cop – who is willing to enforce its will. It sits in magnificent impotence and becomes less relevant with each passing day. Presently it is pretending to indict the United States in order to prove it is not simply a court for the prosecution of Africans – even as it desperately desires the US Army to become its cop in masquerade. Then perhaps we may depend upon the responsibility of nations. The World’s leaders all agreed to the Outcome Document of the High-level Plenary Meeting of the General Assembly in September 2005. Paragraphs 138 and 139 to be specific. Here may be found the UN’s understanding of the ‘Responsibility to Protect’ (R2P). Here they affirmed that the international community has the responsibility to intervene when a nation falls into chaos such as that which currently grips Syria. The advocates of R2P claim that it is an emerging norm that will soon shape the behaviour of nations. Indeed, R2P was invoked in 2011 before the intervention in Libya. It was said at the time that this was a new dawn in world affairs. Now the concept could be re-invoked in full form for the sake of Syria. A united Security Council would mandate action to end the suffering, and nations would respond to the call. But of course it wasn’t a new dawn. The memory of Libya hung over the events in Syria. Great Power conflict emerged again as the Security Council became deadlocked. No action in Syria could possibly be authorised, let alone an R2P mandate. There was no call. The emerging norm wasn’t so emergent after all. R2P has since become a comatose patient kept on life support in the halls of academia. So Syria continues to burn. And the Internationalist rages in despair, for all his plans have come to naught. But his repeated failures present a common theme to the observer. Why does he continuously fail? Because he chooses to see the nations as other than what they are. He is blinded by his own vision. In his imagination, he sees noble actors who selflessly devote themselves to justice. He expects the Security Council to put aside national interest in service to the common humanity under threat. He expects the ICC to judge rightly and nations to enforce its righteous judgments for the sake of Law. He expects nations to answer the call and selflessly offer the blood of their sons for the sake of complete strangers in a foreign land. He expects the recipients of that service to respond in gratitude. But his expectations are continually disappointed. The nations are not noble actors. In truth, the nations are beasts possessed of fang and tooth and claw. They stare at each other in suspicion and hostility and jealously guard what they own. Why does the Security Council fail to act? Because it was designed as a hegemony of five powers and so it must serve the interests of those five powers. It does not exist to provide collective security no matter how terrible the situation. It provides at best selective security depending upon the interests of the powers that be. Why does the ICC stand impotent? Precisely because it was created as an independent court and therefore cannot be controlled. Therefore no major power has any interest in enforcing the will of the Court. It will only become effective when it serves the interests of the major powers. Why do nations refuse to intervene in places like Syria? Because the cost is too great to bear. The expenditure in blood and money is considered too high regardless of the benefit to the Syrians. And what is worse, the Syrians would eventually turn on the intervention. Too many in Syria would say, “Come here. Kill my enemies and give me power.” When their expectations are thwarted they would return to violence. This is not the world as we would want it: this is the world as it is. We may wish that it were otherwise, but it has been this way for 8000 years of human history, and we are not going to change it. The nature of man is immutable. We make a capital error when we act as if human nature could be improved by dint of human effort. Is this a counsel of despair? No, it is a counsel of reality. Sin is our common lot. The world is inhabited by fallen man. Therefore we must act as if it is inhabited by fallen man. We must never forget that swords will not be beaten into plowshares before the Last Day. The Central Progressive Insight is that the moral condition of man can be improved by constructing institutions that change his external conditions. This is why the Internationalists fail over and over and over again. They seek to build councils and courts and rules and agreements and norms and processes. They seek to change the external in hope that the nature of man will follow in stride. But no collection of courts or councils or rules can change reality. The problem with man is internal. And it is beyond human remediation.